To fetch means ‘to go and get something and bring it back’ or ‘to cause someone to come.’ In financial terms, fetch means ‘to sell for.’ Informally, it can mean ‘to strike or deliver a blow.’ As a noun, fetch is the act of fetching, although this is rarely used. Unrelatedly, a fetch is the apparition of a living person. The boy went to fetch some water from the well. Mary is very ill; someone should fetch a doctor. In return for the other man's insult, Neil fetched him a punch to the nose. The dog spent a long time over his fetch. Sue knew Alan was miles away, yet she saw him standing in front of her; "It must be his fetch," she thought. Fetch is a command you give to a dog when you want it to retrieve something for you and also a game that dogs love to play, where you throw something for them and they bring it back. As you can see in this Doritos commercial though, you should be careful about making the command clear! Fetch dates back to before the year 1000. The Old English verb fecc(e)an (which became fecchen in Middle English), originally meant ‘to bring or bring to,’ or ‘to seek, gain or take.’ It is a variant of the Old English verb fetian or fatian (‘to bring near, bring back or obtain,’ as well as ‘to induce’ or ‘to marry’). Most linguists agree that it can be traced back to the Proto-Germanic fetan, and further back to a Proto-Indo-European verb meaning ‘to walk’ from the root ped (foot). It is related to the Old English root -fat (found in sīthfat, ‘journey’), the Old Frisian fatia (to grasp, seize or contain), the Old Norse feta (to find your way), the Middle Dutch vatten and the Old High German sih faggon (to mount or climb), and the German fassen (to grasp or contain), as well as the Latin pes, pedis, the Greek pos, the Old English fot, the German Fuß (all meaning foot), and the English words foot, expedition, impede, impair, octopus, pawn, pew and tripod, among many others. The sense expanded to include ‘to reach,’ ‘to deliver’ and ‘to effect’ by the 15th century, with ‘to bring in as a price’ first appearing around the year 1600, and ‘to bring back to consciousness’ in the early 17th century. 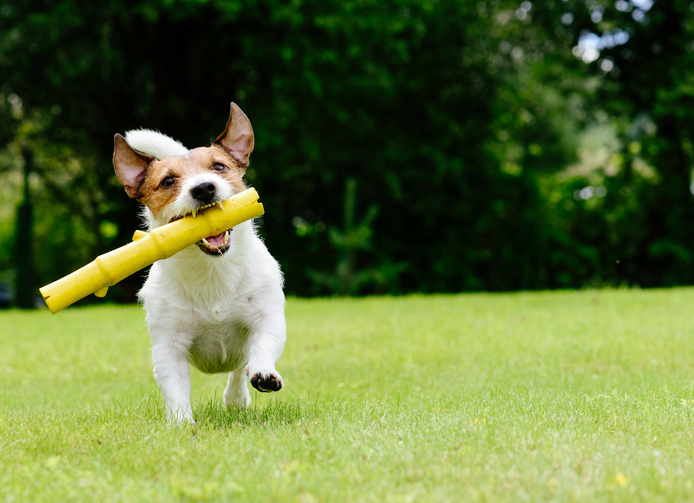 Fetch has been used for the dog’s action since around the year 1600, shortened from the phrase fetch and carry. The noun, meaning ‘the act of fetching,’ dates back to the mid-16th century, and comes from the verb. The unrelated noun fetch, meaning ‘the apparition of a person,’ ‘a spectre’ or even ‘your double’ dates back to the late 18th century. Its origin is uncertain, but thought to be from a dialect of English, or possibly Irish.